Bibs have been used in one fashion or another for over a century. They have been primarily used by mothers to help protect their children’s clothing from drool, food, drink, and other messes. 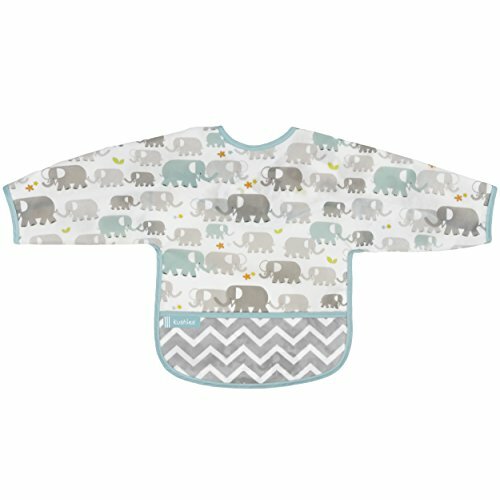 While early bibs were simply a means to an end, much more thought has gone into today’s modern bibs to ensure that each bib will not only fulfill its duties in keeping the child’s clothes free from soiling but that each bib will also have a unique look. Many have popular cartoon characters or whimsical shapes and pictures. Today we discuss the different types of bibs and the best baby bibs to fit your needs. There are a few things to determine when looking for the best baby bib. You need to determine whether the function of the bib is for feeding, drool, or whether you need a full sleeved bib. Each of these bibs is designed to be worn by children of a specific age, size, and is also intended for a certain level of mess. Drool bibs are designed to be worn by newborns up to six-months-old. They are not meant to handle the massive messes associated with food, drink, or paint. The best baby bibs for drooling are designed to be highly absorbent, however, and will protect your child’s clothing from drool, spit up, and any other light, unexpected messes that come from your baby’s mouth. Feeding bibs are designed to be used during mealtimes. They are often made of either plastic or rubber backed fabric or a solid plastic. This makes them easy to clean up whether they are having their first taste of pablum or a hearty meal of spaghetti and meatballs. The best bibs for feeding are easy to clean by hand or machine, waterproof, and can even be disposable. These are often the most popular and common bib that people use. In recent years the full-sleeved bib has found popularity. Full-sleeved bibs can come as a drool bib, feeding bib, or a smock. The various designs make them suitable for children of all ages and loved by parents everywhere for their full coverage of shirts. 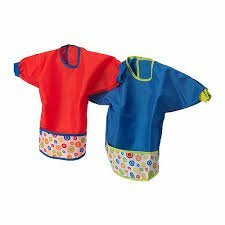 Known to some as smocks, these bibs are suitable from birth to grade one depending on its intended use. Many parents like using full-sleeved bibs for much more than just drool and food, but also as protection for older children while painting, gluing, or working with other messy items. Since these bibs have large contact points, parents should be mindful of the materials to avoid a possible allergic reaction. There are a few benefits to using a baby bib that a new mom will learn in a hurry. And these advantages don’t disappear as your baby progresses to a toddler, they just change a bit. Many of the bibs available are made of fabrics that can be put directly into the washing machine with your baby’s other clothing, as well as in the drier. Those that need to be hand washed aren’t that much more difficult to rinse out, as they are usually made of materials that won’t absorb the mess spilled on them. The larger bibs that offer full coverage can be used for more than just feeding time. You can put them on over your child’s clothing while they paint or play with clay to keep their clothing spotless. The Tommee Tippee Closer to Nature Milk Bib is a soft, absorbent feeding bib. This bib is for babies from birth to six months, although it may be small for some six-month-olds. The bib is made from a polyester blend, and it is excellent for those first few months of bottle feeding, burping, and drool. This bib also has a “dribble catcher,” which is a thick, rolled piece of fabric which quickly wicks away moisture from your baby’s skin to prevent discomfort and rashes. This feature helps to make this bib suitable for even the smallest of babies. The Tommee Tippee Closer to Nature Milk Bib is easy to clean and can be washed by hand or in the washing machine. It can even go in the dryer, although some people report that it will curl if the dryer heat is too high. It comes in three color sets: blue, pink, and cream. All of which are subtly colored with a light background. Overall, this is an excellent option for a baby 0-3 months old because it may be too small for an older child. It is particularly useful for very small babies as it is gentle and easily adjustable. The Neat Solutions Solid Knit Terry Feeder bib is a very simple, soft bib designed for feeding babies from birth to age two. While they are designed to be used by older babies to toddlers, they only cover approximately six inches below the chin. This feature makes this bib suitable for teething at older ages, but not for messy eaters. The Neat Solutions Solid Knit Terry Feeder bib is 73% cotton with 27% polyester making them durable and soft but not waterproof. Many parents find these excellent in that they are white, stand up well to washing and bleaching, and can even be customized with either fabric markers or embroidery. This makes the bib ideal for a personalized gift for those who are artistically inclined. This bib set comes in white although other sets have varying colors. Overall this is a feeding bib that, as the child ages, becomes more suitable as a drool or teething bib. It is also easy to customize and decorate making it fun and affordable for crafts and keepsakes. The Kladd Prickar full-sleeved bib is designed for babies from 0-18 months. Since this bib is not designed to be absorbent, they are best used for babies that can sit up and eat solid foods. Because this bib is so large, it is excellent for young toddlers that have discovered the joys of spreading their food everywhere. The Kladd Prickar full-sleeved bib is nylon coated poly, which makes it waterproof – this excellent news for parents as it covers from wrist to wrist. This bib can be washed and hung to dry – it should not be put in the dryer. However, if you find that it is losing its waterproof abilities, then you can iron it on a very low setting to make as good as new. The velcro clasp on this bib makes getting baby in and out simple, and the pocket on the front catches any food that would might fall. The Kladd Prickar full-sleeved bib is excellent for kids who like to make a mess! The Kushies Waterproof Bib with Sleeves is another full-sleeved bib that comes in two sizes to suit your child’s needs: Infant and toddler. These bibs are lightweight and waterproof and made from nylon coated polyurethane, which means they do not absorb spills. Any spills collect in the pocket at the bottom of the bib and can easily be wiped up with no issue. These bibs can be washed in the normal washer but should not be placed in the dryer. They can be ironed on low to increase their waterproofing ability as they age but do not require it. This adorable bib comes in 6 different patterns, including Blue Crazy Circles, Fuchsia Modern Flowers, Navy Mustache, White Elephants, White, Doodle Hearts, and White Little Safari. The Kushies Waterproof Bib is best used for children who are able to sit on their own and have begun the adventures of feeding themselves. They cover your child from one hand to the other, making the best toddler bib for eating who want to turn their food into art while wearing their Sunday best. This bib allows the child to explore their world of food, paint, play dough, and other messy activities without ruining your child’s clothing. The coverage of this bib makes it loved by parents everywhere. 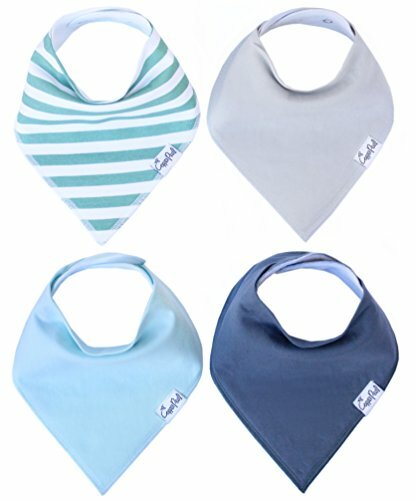 The Copper Pearl Baby Bandana Drool bibs is a set of four blue-based design bibs that are highly absorbent with nickel-free snaps. There are eight other color variations to suit your design preference and child. They are made for babies from three-months-old to two-years-old. These bibs are not waterproof and are not intended for feeding. They are, however, able to stand up to the copious amounts of drool from newborns and teething toddlers while looking adorable and making a distinct fashion statement. The Copper Pearl Baby Bandana Drool bib can be hand washed and hung to dry to keep them soft and to wick moisture away quickly. The bibs come in a 4-pack with a selection of patterns, and they make an excellent gift. The fact that they come with a money back guarantee is an added bonus. Your baby can be stylish and look ready for the adventures you are planning to take in your all-terrain stroller. 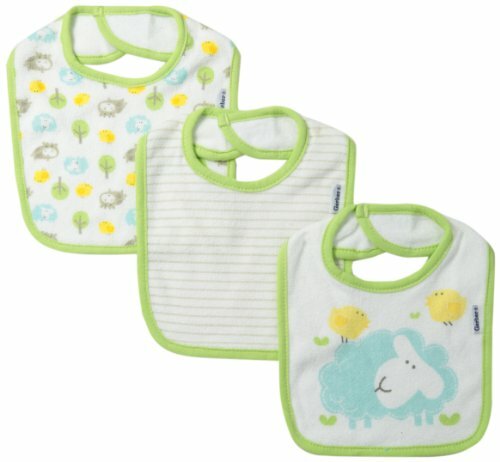 The Gerber Dribbler Unisex 3-Pack Interlock Dribbler Bibs are full of fun and whimsy. They are designed for your new baby all the way to three months. 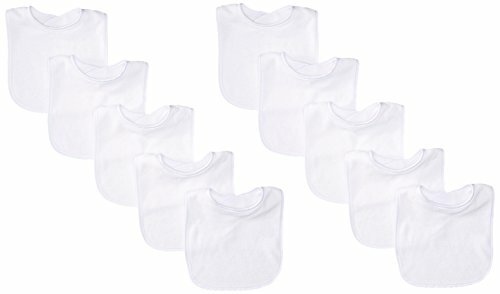 These bibs are made of 80% cotton and 20% polyester knit terry cloth, which makes them soft on babies skin, plus extra absorbent for a dry comfy infant. On the back is a soft neck closure that holds tight without irritating your baby’s skin. The Gerber Dribbler Bibs can be washed and dried in the washer and dryer making them a favorite of parents. Because these bibs are cotton you should avoid drying them on a high heat to prevent warping or shrinkage. Gerber has several other design sets to choose from on this design line, which are suitable for boys, girls, and both. Bibs come in many shapes, sizes, and colors, but at the end of the day, the best baby bib is the one that suits both you and your child’s needs. Choosing the best baby bib may require some trial and error. However, there is always a bib out there that is not only well-suited to your needs but also your taste in design as well. While there are many types of bibs out there that will do the job of protecting with ease, none will protect your floor or your child’s hair from the mess in their hands. If you like any of the bibs that you see in this article, please click one of the Buy Now buttons to make your purchase on Amazon. As an Amazon affiliate, we make a small commission off any purchase made from a click through from our website, which is how we are able to provide you with these amazing informative reviews. Clicking through from our website will not cause you to pay more on Amazon, as the price is the same if you go to Amazon directly – the difference is the commission that we receive. If you would like more informative articles such as the best strollers on the market or the best travel system for baby, please feel free to look around the site. Thanks for visiting mytinytraveller.com.